The options market believes there is a 15% chance that the S&P 500 will be 10% lower than its current price at year end. This marks an increase in the odds of a large stock market correction from a month ago. 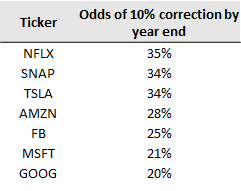 The table is interesting because it shows that NFLX, after being up 120% over the past 12 months on blockbuster earnings, is now being priced by the options market to have the highest likelihood of seeing a 10% correction. TSLA, which has struggled with production delays and is down 16% over the last 12 months is also priced to have a high likelihood of seeing further steep declines. SNAP, which has returned -36% over the last 12 months is priced to have high odds of continuing it’s decline.